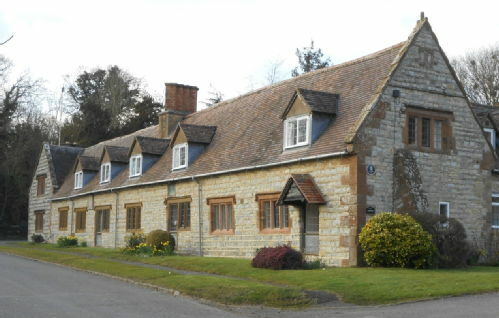 Almshouses providing accommodation for poor people are a common feature of many towns and villages in England, and can be a useful source of information about administration and participation in the English parish. 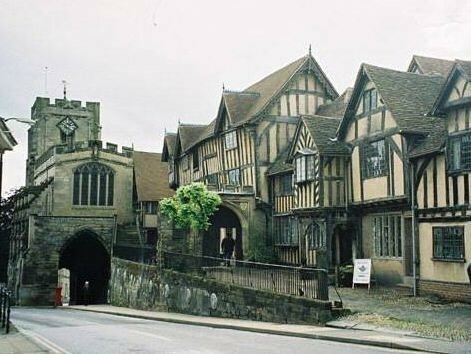 Some wealthier post-Reformation almshouses were incorporated institutions, such as the Master and Brethren of the Lord Leycester Hospital in Warwick, founded by Robert Dudley, Earl of Leicester, in 1571. Like their medieval predecessors such as the well-known St Cross Hospital in Winchester, they led an independent, self-sufficient existence providing a comfortable lifestyle for a select group of privileged almspeople. Lord Leycester Hospital, Warwick (1571). All photographs by the author. But many more almshouses were poorer, simpler establishments serving the local community and often embedded in the welfare systems of the parish. For example a very different almshouse consisting of three little cottages was founded in Warwick by Thomas Oken, a local mercer, in the same year as Leicester’s. Through the charity he established before his death, Oken dedicated all his considerable wealth to the benefit of the town. This charity, run by local trustees, not only supported the almshouse but provided the town with a schoolmaster; paid the wages of the herdsman and beadle; provided for poor maidens on marriage; maintained the town’s bridges, wells and roads; and gave twelve leather fire buckets to be kept ‘in some place always in rediness’ in case of fire. Despite this generosity the stipends assigned to Oken’s almspeople were only four shillings a year, in contrast to the much larger sums received by the Lord Leycester brethren, and his almshouse performed a very different function from Leicester’s grander establishment. Unsurprisingly, the early occupants of Oken’s almshouses received parish poor relief, and they can be identified in Warwick’s 1582 census of the poor. They received relief in varying amounts: Sybell Yardley, for instance, aged 80, received two pence a week; Isabell Milward aged 60 received four pence; and Margaret Fletcher, widow aged 100, ‘impotent and blind’, received six pence a week. Many other early modern almshouses like Oken’s would have given small stipends which were insufficient to live on, or given none at all. My own research using data from six English counties has shown that barely half of all almshouses in early modern England gave occupants stipends which were sufficient to live on. Residents of these almshouses would have had to ‘make shift’ like other poor people in the community, through work if they were able, poor relief, charitable handouts, and support from family and friends. Yet with or without stipends, the provision of housing for poor people was still a valuable asset, and access to an almshouse place might be highly sought after. Poorer almshouses like Oken’s three little cottages, were often little more than a house or row of cottages donated for the use of the poor by a local benefactor, and managed by the parish officers who allocated the places. Even endowed almshouses like Oken’s with local trustees might be supervised on a day to day basis by parish officers. 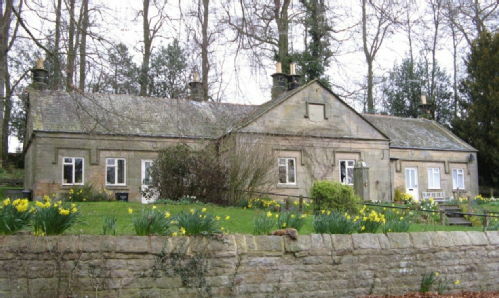 For instance, William Hutchinson who founded his almshouse in 1674 specified from which of the townships in the vast upland parish of Romaldkirk on the border of Durham and North Yorkshire his almspeople were to be chosen, and the parish clerk was made custos and given responsibility for supervising them. Similarly, Sir Roger Manwood appointed the parish clerk to be warden of his almshouses at Hackington, near Canterbury, founded in the 1570s for six poor aged men and their wives, with the Mayor of Canterbury responsible for annual oversight. The range of six almshouses which Manwood built next to the parish church in 1590 included a seventh, more substantial, house for the parish clerk to live in, so that he ‘may be near at hand for ready service in all church matters’. How parishes with an almshouse might use this resource to benefit their poor can be examined in more detail in those places where records have survived. A good example of this is Leamington Hastings in Warwickshire, which has a range of extant records from the seventeenth century, including those of the Humphrey Davis almshouse founded in 1607. 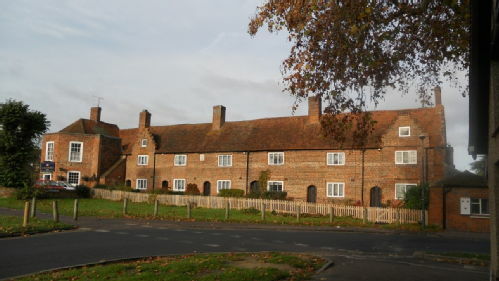 I used a case study of this parish in my book, Almshouses in Early Modern England, to examine how the local welfare system operated on the ground in a single parish, and the role the almshouse played within it. By combining information from the almshouse records with parish registers, manorial records, hearth tax returns and overseers of the poor accounts I was able to construct meaningful stories about the lives of some early almshouse residents, and how the parish elite responded to the needs of the poor in the parish. So, for instance, Jane Man, a 36 year old unmarried woman living in the almshouse to look after her elderly father Thomas, was evicted in 1694 when she was found to be pregnant. She was sent to the house of correction in Warwick for bastardy. But in 1706 she was once more allowed to live in the almshouse and made herself useful looking after other residents. By this time she was 48 years old, still unmarried, with no means of support; both her parents were dead and her illegitimate child, if still living, would have been apprenticed or in service. Admitting her to the almshouse, despite the earlier scandal, was a pragmatic decision by the authorities as the parish would otherwise have had to maintain and house her. Widow Turner and her husband Joseph had lived in a house provided by the parish for many years, and had been in receipt of poor relief and occasional charity handouts towards the end of Joseph’s life. When he died in 1688 Widow Turner moved into the almshouse, freeing up their parish house for someone else. Henry Bliss, living with his wife in the almshouse in 1698, had in earlier years struggled to raise his six children. He had frequently received poor relief in the 1660s and 1670s and seems to have been in prison for debt at some stage. As well as his almshouse stipend, he was paid from a parish charity to teach the village children, with his wife helping with the little ones. These examples show the almshouse was very much an integral part of the parish support network. All the parish resources, including poor relief, church, almshouse and charitable funds, appear to have been pooled and used in a fairly pragmatic way to benefit the whole parish. The people making the decisions were divided by religious affiliation, with several fined for not attending church, and one leading parishioner, Edmund Clarke, obtaining a licence in 1689 to hold religious worship and Presbyterian meetings in his house as soon as it was legal to do so. Yet he and his neighbours worked together across confessional boundaries to manage the affairs of the parish, demonstrating that after the bitter religious and political divisions of the civil war years, using the welfare resources of the parish for the benefit of everyone was a unifying activity for this parish which the established church could no longer provide. Warwick County Record Office CR1618/WA3/84 Copy of Thomas Oken’s Will. Thomas Kemp (ed. ), The Book of John Fisher, Town Clerk and Deputy Recorder of Warwick (1580 – 1588), Warwick (n.d. c.1900), pp. 93, 169.. .
 Angela Nicholls, Almshouses in Early Modern England: Charitable Housing in the Mixed Economy of Welfare 1550 – 1725, Boydell Press, Woodbridge (2017), p.179. Durham County Record Office EP/Rom12/2 Regulations for the management of the Bowes and Romaldkirk Charities. Derek Ingram Hill, The Ancient Hospitals and Almshouses of Canterbury, Canterbury (2004), p. 36. Angela Nicholls, Almshouses in Early Modern England: Charitable Housing in the Mixed Economy of Welfare 1550-1725, Boydell Press, Woodbridge (2017), pp. 188-223. Dr Angela Nicholls is an Associate Fellow of the Warwick History Department and author of Almshouses in Early Modern England: Charitable Housing in the Mixed Economy of Welfare 1550 – 1725, Boydell Press, Woodbridge (2017).